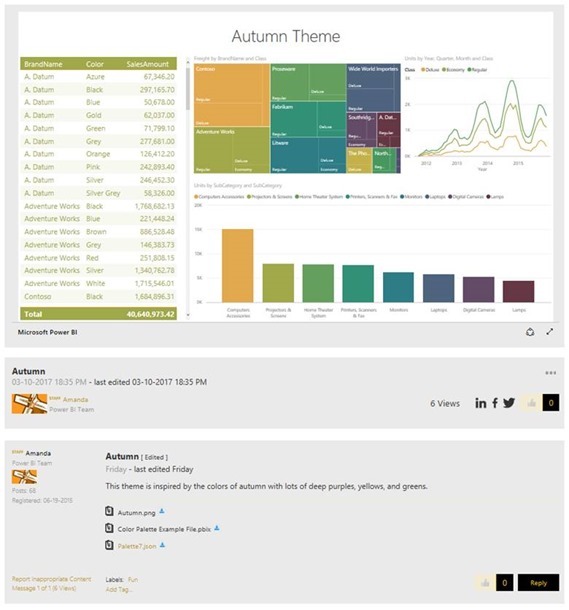 We are very excited to announce the launch of the new theme gallery in the Power BI Community. 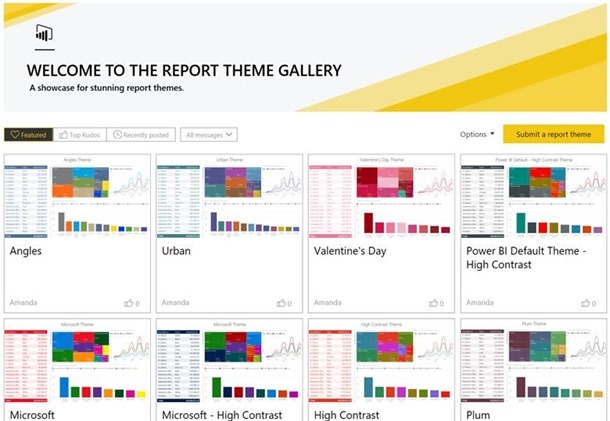 This gallery is a dedicated space for you to share and find new themes for use in your Power BI reports. Theming is a new preview feature in the Power BI Desktop that lets you pick colors to use in your charts and to show in the color palette. This feature is a great way to quickly incorporate your company branding or a little personality to your reports. To add a theme to your report, you import a JSON file listing all the colors you want to use in your report’s charts. You can learn more about the theming feature in our March Desktop release blog post or documentation. Do you need a little inspiration for your own themes or don’t want to create your own JSON file? The theme gallery is the perfect place to get started. You’ll be able to download any theme you like in the gallery. From there you can import it as is into your own reports or use it as a starting place and make any modifications you want before importing. Want to show off your design prowess? Submit themes you’ve created to the theme gallery for others to see and use. If community members like your theme, they’ll be voted up to the top of the list. You will also have pride knowing you’ve helped others create beautiful reports. Need a theme that is high contrast or color blind friendly? There is a whole section of the gallery geared towards themes that are more accessible than standard colors palettes. You can find these themes by filtering the list down to Accessible themes. Make sure to visit this new gallery in the Power BI Community, submit your own creations, and kudos themes you love!